Mr. S. P. Hicks, of Mt. Sterling, Tenn., is in this section looking after the business of the Home Nursery, of Mt. Sterling. 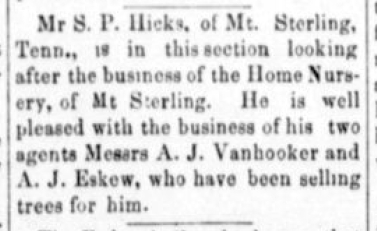 He is well pleased with the business of his two agents Messrs. A. J. Vanhooker [sic Vanhooser] and A. J. Eskew, who have been selling trees for him. Source: Crittenden Press. (Marion, Ky.) 1879-1907, November 17, 1892, Image 4 - Chronicling America - The Library of Congress. 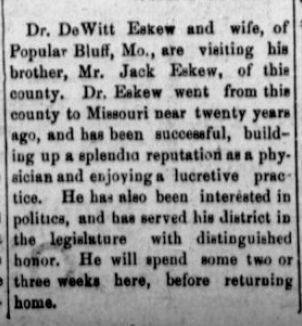 Dr. DeWitt Eskew and wife, of Popular [sic] Bluff, Mo., are visiting his brother, Mr. Jack Eskew, of this county. Dr. Eskew went from this county to Missouri near twenty years ago, and has been successful, building up a splendid reputation as a physician and enjoying a lucretive [sic] practice. He has also been interested in politics, and has served his district in the legislature with distinguished honor. He will spend some two or three weeks here, before returning home. Source: Crittenden Press. (Marion, Ky.) 1879-1907, May 25, 1899, Image 3 - Chronicling America - The Library of Congress. Jasper McDowell says that Jack Eskew and Frank Roberts are still breaking corn land and planting corn. Source: Crittenden Press. (Marion, Ky.) 1879-1907, June 29, 1899, Image 3 - Chronicling America - The Library of Congress. 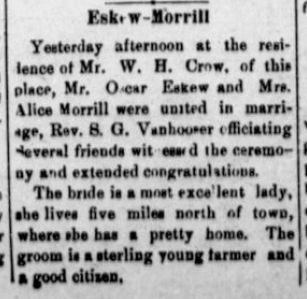 Yesterday afternoon at the residence of Mr. W. H. Crow, of this place, Mr. Oscar Eskew and Mrs. Alice Morrill were united in marriage, Rev. S. G. Vanhooser officiating. Several friends witnessed the ceremony and extended congratulations. The bride is a most excellent lady, she lives five miles north of town, where she has a pretty home. The groom is a sterling young farmer and a good citizen. Source: Crittenden Press. (Marion, Ky.) 1879-1907, November 2, 1899, Image 3 - Chronicling America - The Library of Congress. John Eskew calls his ten pound Democratic boy Ben. Source: Crittenden Press. (Marion, Ky.) 1879-1907, October 4, 1900, Image 8 - Chronicling America - The Library of Congress. An infant son of John Eskew died Wednesday night. Source: Crittenden Press. (Marion, Ky.) 1879-1907, November 15, 1900, Image 4 - Chronicling America - The Library of Congress. Harvey Eskew has been very sick with catarrhal fever. Source: Crittenden Press. (Marion, Ky.) 1879-1907, December 6, 1900, Image 8 - Chronicling America - The Library of Congress. Mr. A. J. Eskew, of the Piney neighborhood, has discovered a bed of ochre and umber on his farm. Source: Crittenden Press. (Marion, Ky.) 1879-1907, February 20, 1901, Image 5 - Chronicling America - The Library of Congress. Twin boys were born to the wife of Mr. Oscar Eskew, Sunday. Source: Crittenden Press. (Marion, Ky.) 1879-1907, March 12, 1903, Image 8 - Chronicling America - The Library of Congress. Born to the wife of John Eskew, a girl Sunday morning. Source: Crittenden Press. (Marion, Ky.) 1879-1907, January 21, 1904, Image 5 - Chronicling America - The Library of Congress. New feed store on Bellville street, rear of Cliftons, next door to Ramage tin shop and near the photograph gallery will handle corn, hay, bran and ship stuff. Fredonia Valley flour. Bran 90c per hundred.--M. O. Eskew, new feed store. Source: Crittenden Press. (Marion, Ky.) 1879-1907, September 1, 1904, Image 5 - Chronicling America - The Library of Congress. 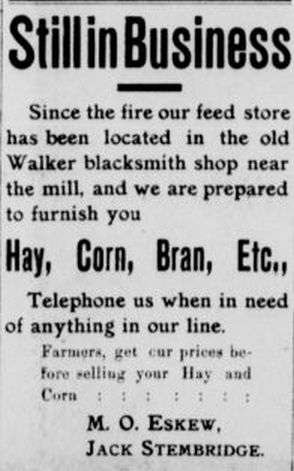 Corn 70 cents per bushel at the New Feed Store. M. O. ESKEW. 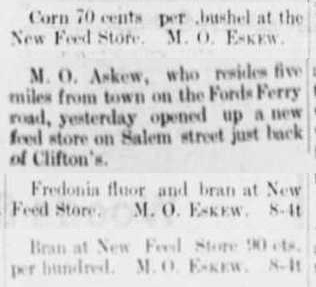 M. O. Askew [sic], who resides five miles from town on the Fords Ferry road, yesterday opened up a new feed store on Salem street just back of Clifton's. 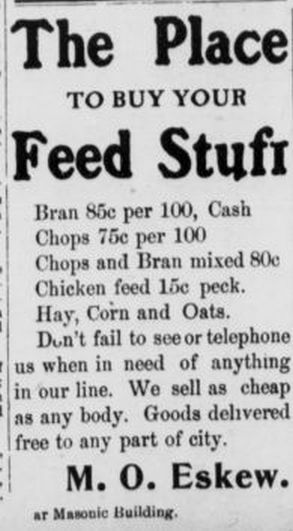 Source: Crittenden Record. (Marion, Ky.) 1904-1907, September 2, 1904, Image 4 - Chronicling America - The Library of Congress. M. O. Eskew has bought out David Gilliland's meat shop and will continue the business and keep the best meat obtainable, and wants your trade. Source: Crittenden Press. (Marion, Ky.) 1879-1907, November 3, 1904, Image 5 - Chronicling America - The Library of Congress. M. O. Eskew has purchased the butcher business of D. E. Gilliland. Source: Crittenden Record. (Marion, Ky.) 1904-1907, November 11, 1904, Image 5 - Chronicling America - The Library of Congress. M. O. Eskew has sold his butcher shop on Carlisle street to M. Schwab. Source: Crittenden Record. (Marion, Ky.) 1904-1907, November 18, 1904, Image 5 - Chronicling America - The Library of Congress. M. O. Eskew has sold his feed store on Bellville street to A. J. Stembridge, who will continue the business in connection with his butcher trade. Source: Crittenden Record. (Marion, Ky.) 1904-1907, January 6, 1905, Image 5 - Chronicling America - The Library of Congress. Source: Crittenden Press. (Marion, Ky.) 1879-1907, March 9, 1905, Image 5 - Chronicling America - The Library of Congress. Source: Crittenden Press. (Marion, Ky.) 1879-1907, May 4, 1905, Image 4 - Chronicling America - The Library of Congress. John Eskew, who has been employed in Gilbert's blacksmith shop several years, left Monday for Uniontown, where he has accepted a position in the shop of R. F. Deboe. Source: Crittenden Press. (Marion, Ky.) 1879-1907, June 15, 1905, Image 5 - Chronicling America - The Library of Congress. 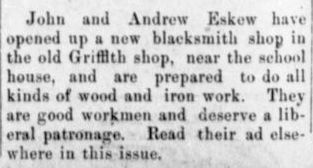 John and Andrew Eskew have opened up a new blacksmith shop in the old Griffith shop, near the school house, and are prepared to do all kinds of wood and iron work. They are good workmen and deserve a liberal patronage. Read their add elsewhere in this issue. Source: Crittenden Press. (Marion, Ky.) 1879-1907, June 29, 1905, Image 5 - Chronicling America - The Library of Congress. 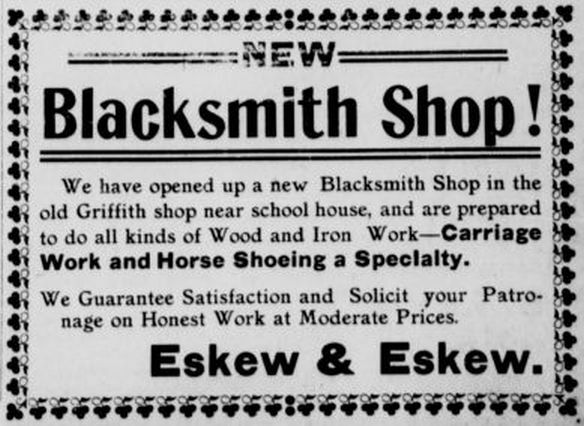 Eskew & Eskew have opened a general blacksmith shop at the old Griffith stand opposite school house. Source: Crittenden Record. (Marion, Ky.) 1904-1907, July 7, 1905, Image 5 - Chronicling America - The Library of Congress.